Heather here. Having finished up our many visits with friends and family on the East Coast, we now had to start our journey back West. On the road again. We loaded up the car and entered Denver, Colorado into our GPS. It would be yet another long haul across this great land of ours. We drove through 7 states in 2 days. Next stop: the home of good friends of ours, Courtney, Jon, and their two young daughters, who live in a lovey neighborhood of Denver proper. Once arrived, we found that Courtney and Jon had set up an amazing little carriage house for us, above their garage in the back of their property. It was perfect! They were the most gracious hosts, and we couldn’t have been more comfortable and happy to spend a few days with them and their two beautiful little girls, Willa and Emerson. They showed us their Denver: great restaurants, cute parks, and their local circle of kind friends. We had such a great time, we were sad to leave, but we still had a few more states to cross before we got back to California. So with a bit of a heavy heart, we said goodbye after an amazing few days. Our plan was to drive directly across Colorado to get to Utah, the land of many national parks. But we had one very important detour to make along the way. We headed up to a tiny mountain town north of Steamboat Springs to meet the breeder we had committed to adopting a puppy from. Yes, we had to go see our new puppy! 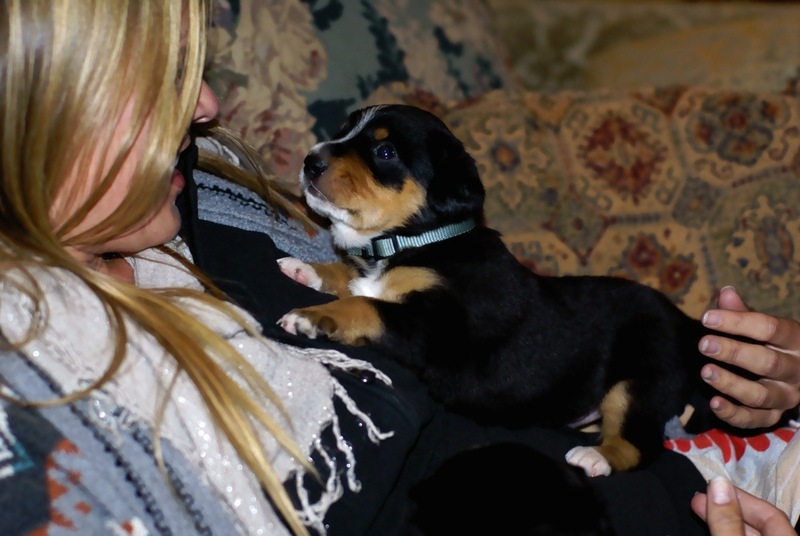 The breed of dog is called an Entlebucher, and it is the smallest of the Swiss mountain dogs. We happened upon this rare breed in a dog magazine a couple years ago, and ever since then, it’s safe to say I’ve been obsessed. We did our research and found this highly-regarded breeder, and lo-and-behold, she had puppies at the perfect timing for us. This trip was just to meet them though, as they were still too young to come home with us. We fell for a little male puppy named Gunnar, and later on when the breeder finalized all adoptions, Gunnar would indeed be ours! Needless to say, it was a magical meeting filled with squirming little furballs of just 4 weeks. 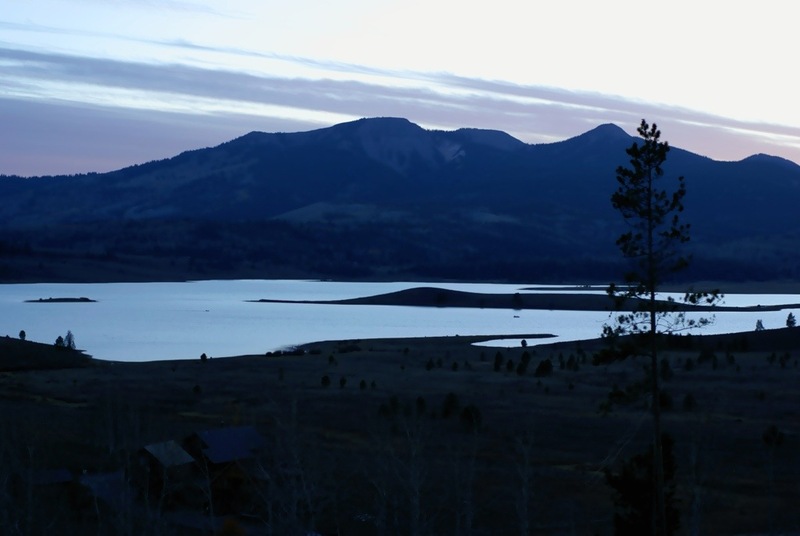 The breeder and her family live in an area called Clark, Colorado, near Hahn’s Peak. 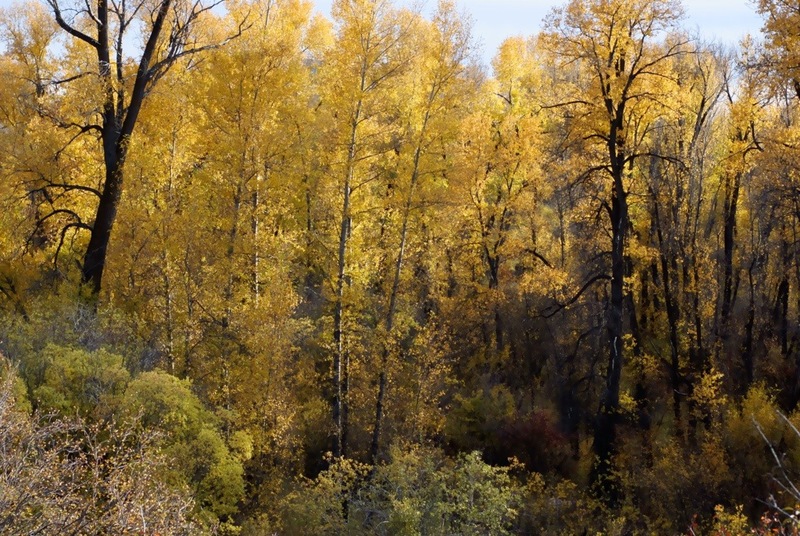 The drive up to Clark was gorgeous – the aspens were bright yellow and the sun was shining through blue skies. 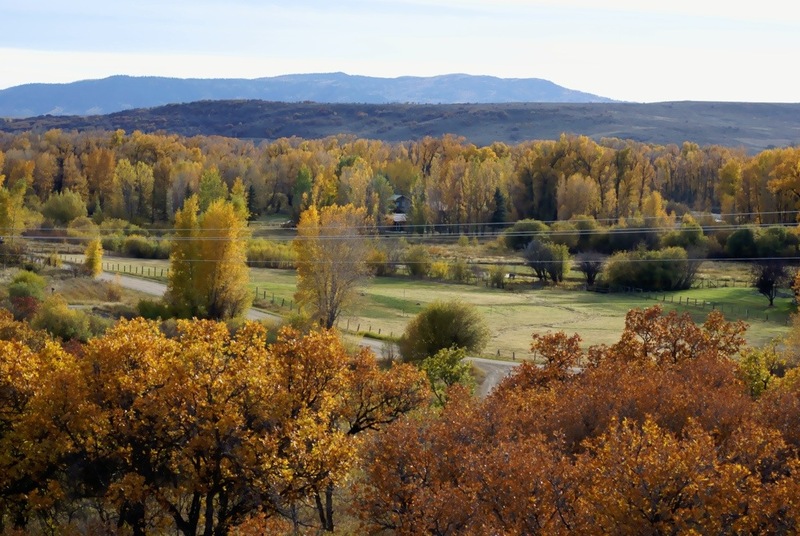 Perfect autumn afternoon filled with picturesque vistas. We were well off the beaten track, and we couldn’t help but dream of coming back here with Gunnar some day. But we said goodbye to Gunnar and everyone in Clark for now – we wouldn’t see him again for another month when he was ready to come home. Onward we drove through Western Colorado and crossed over to Utah. The landscape started to change from rugged, pine-covered mountains to scrubby, craggy, moon-scaped plateaus and odd-shaped rock formations. 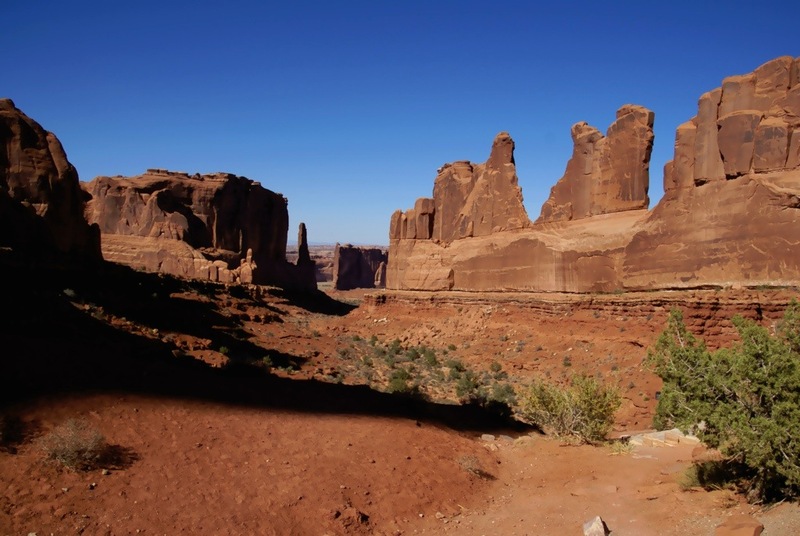 Our first stop was Arches National Park at Moab, Utah. Fred had been to Utah before, but through my virgin eyes, it all seemed surreal. It truly is a unique place, with such geological curiosities to leave even seasoned travelers like us in awe. We did a quick tour of the park, and made sure to save the hike to Delicate Arch for last, to get the loveliest view in the early evening low light. Having traveled to other countries, we saw foreign tourists in our country and appreciate others who come to the U.S. to travel. We enjoyed the fact that there were many visitors from all over the world in these remote places of the American West. We felt a sense of camaraderie, having been in their shoes as a foreign tourist until recently. That night we found the most random, cheap roadside motel to sleep in, called “The Robber’s Roost.” The signage was quirky, but it was quiet. Doors locked tight, we slept like babies. 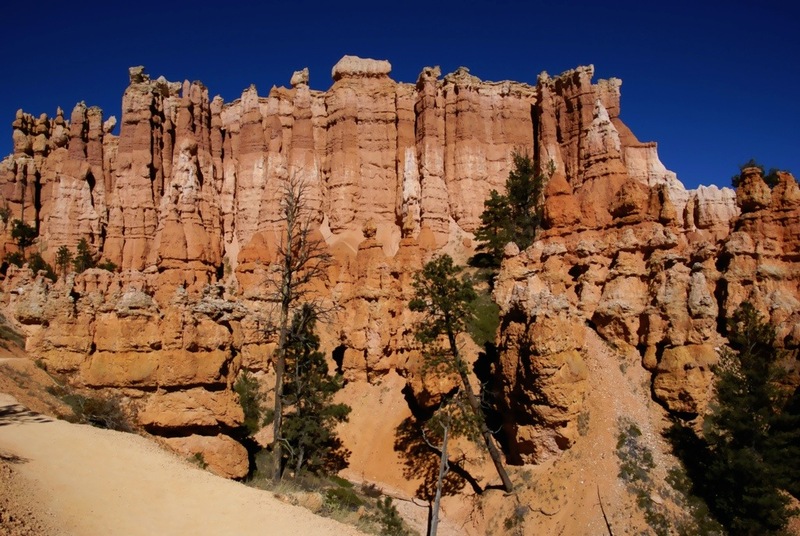 We woke early, grabbed a breakfast sandwich from the equally-quirky cafe down the street where retiree motorcycle bikers were convening, and headed out to Bryce Canyon, not too far west of Arches. In Bryce we decided to camp in the park campgrounds. We arrived early and set up our tent, only to head out for a good hike. We descended into the canyon and walked the most popular trail, that eventually winds up through an area called Wall Street. Aptly-named, it was by far the most impressive part of the trail, with massive, water-carved walls of rock rising vertically, forming narrow channels below. The signage to be aware of boulders falling was a bit unnerving, but luckily no incidents to report. 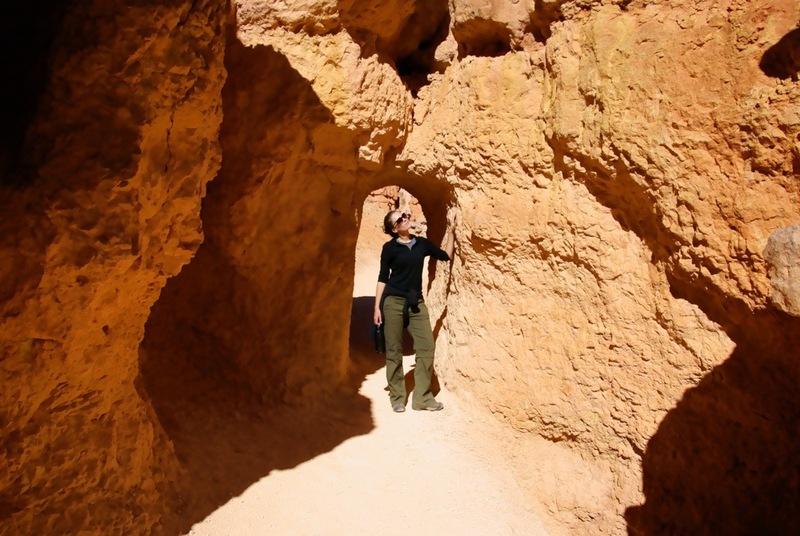 Truthfully we were inspired during the entire hike, and found every nook and cranny worthy of its status as one of the most interesting national parks in Utah, perhaps even in the U.S. Bryce would make it on my top 3 list of American parks – so far anyways! After a good sleep in our tent, we made the short drive to Zion National Park, just an hour or so farther west of Bryce Canyon. Zion was bustling with visitors, which created a touch of traffic as we entered the park through the east entrance. But traffic only made it easier to take in the views of the mountains and formations above. Again, more out-of-this-world geology that boggled our minds. As we approached the long tunnel that connects one side of the park with the other, our anticipation was building. We popped out the other side, and we were suddenly in yet another awesome canyon. 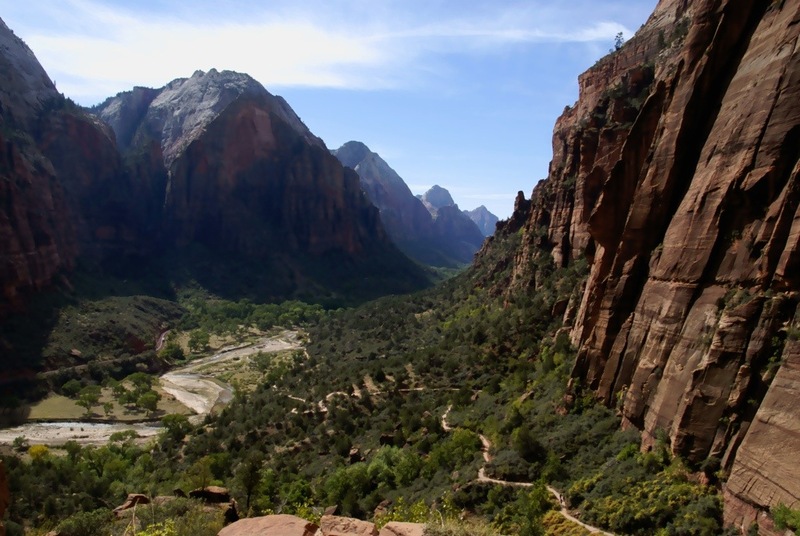 The park has restrictions of vehicle access to some of the more popular parts, so we parked, grabbed our backpacks, and hopped on the shuttle to take us to the trailhead of the Angel’s Landing trail – quite possibly the most popular hike in the park. The hike was strenuous and very vertical, especially for us, having been out of hiking practice since we trekked the Annapurnas in Nepal almost 3 months back. But we made it to the top, er, almost the top. 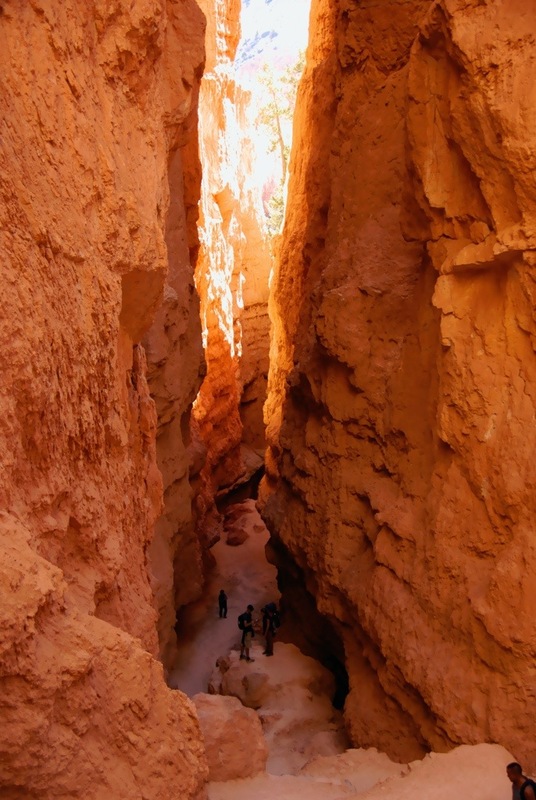 The last little stretch is a hairy, narrow, fatal-looking path that connects two major chunks of rock via a skinny little strip of stone. Fred had crossed this strip on previous visits, but I wasn’t feeling it this time. We made it to the most important section and that was good enough for me! 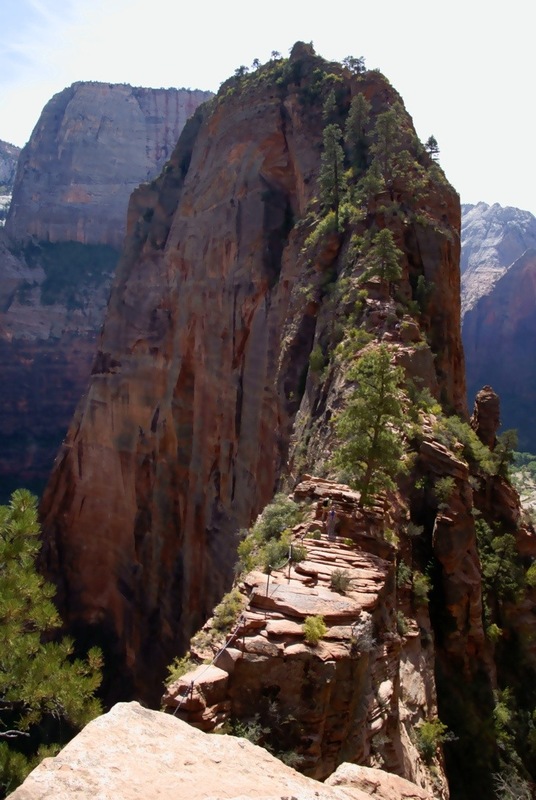 The original plan was to camp in Zion, but we were craving something more…plush. So we found a really good deal at the Hard Rock Hotel in Las Vegas, just a couple hours away, and hit up the vice city for the night. 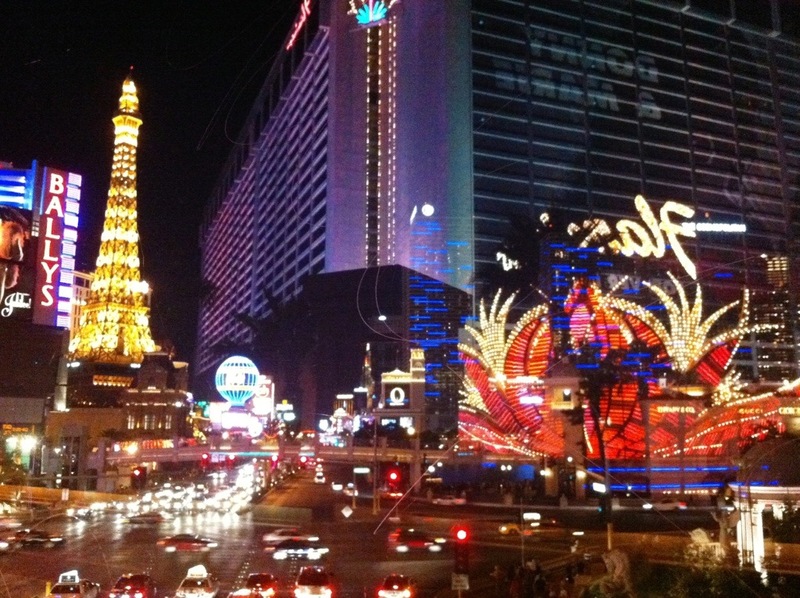 Neither of us like gambling, and we only had the evening, so we checked out some hotels, walked the strip, watched the Bellagio fountain show, and hit the sack. Oh, and we had one of the most decadent meals of our lives at a burger joint in the Aria shopping center – hefty burgers, fries, and milkshakes. Good thing we just went hiking. Next morning we would once again be back in California, almost home. Next stop: Palm Springs! I remember the time I first visited Moab, having just moved to Durango, Colorado from LA. It felt like Mars and I was captivated. That was almost 20 years ago! I live in Park City now, but make it to Moab several times a year. So glad you were enchanted! You guys make me wanna be there now! Great post and I love the photos! I agree that Bryce Canyon is one of the most unique places in the United States and the Angel’s Landing Trail is one of my favorites I have ever hiked. Southern Utah is an extraordinary place. Thanks for sharing! Great photos, I’ve nominated you for a couple of awards – pop across? oh wow that all sounds so greatt!!! good story indeed!!!! 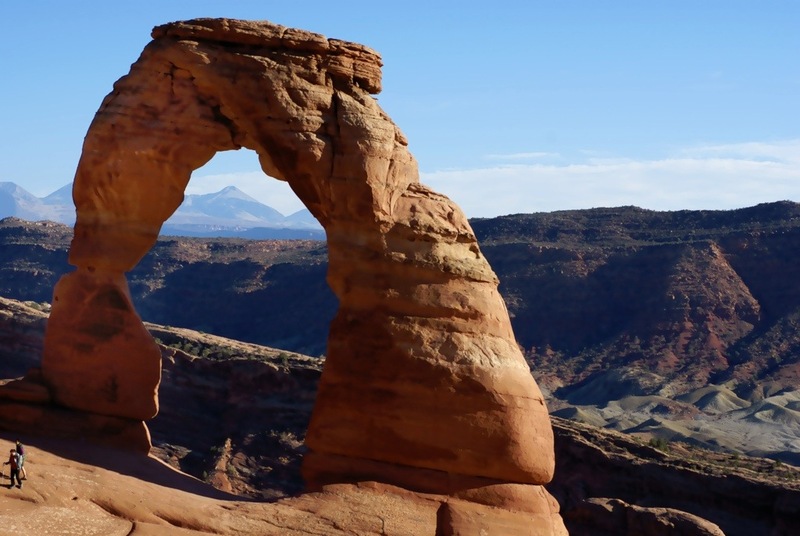 Great photos – I’m amazed you managed to get a photo of the Delicate Arch without people swarming it – it’s very popular at sunset. 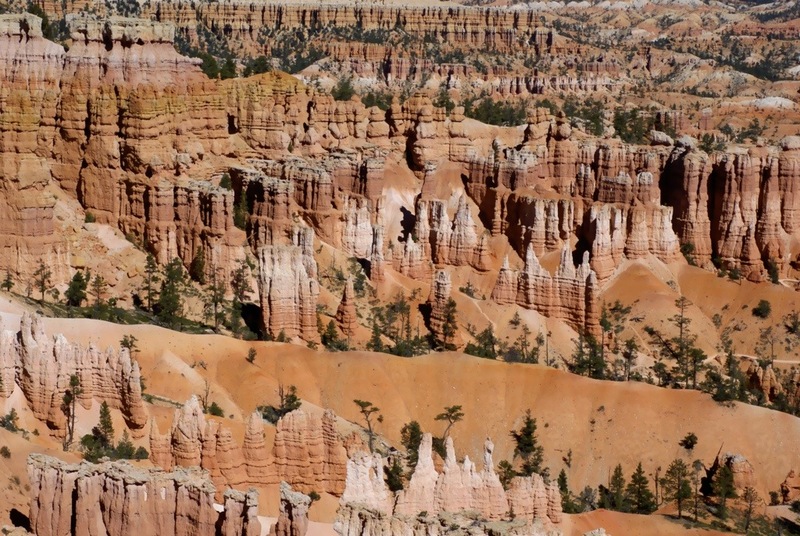 Bryce Canyon is amazing – probably my favourite – as it is just so unique! Your new puppy is so cute! Great shots of Utah. Never heard of Bryce, so thanks for the tip! Good luck with your travels. Beautiful photos! Love all of the detail. We haven’t traveled in the west much except for California, so I thoroughly enjoyed living vicariously through you! Are you guys still around? Write more!